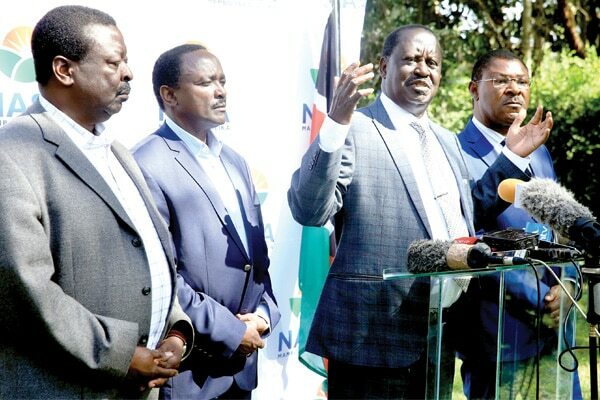 A report published by the Independent Electoral and Boundaries Commission (IEBC) has divulged that Raila Odinga’s National Super Alliance (NASA) lied to Kenyans, when they announced that they had been denied access to the election servers. According to the internal post-evaluation report, IEBC alleges that NASA accessed the servers 34 times as opposed to Jubilee’s 10 times. The opposition coalition is stated to have accessed the servers through one John Walubengo before the release of the election results. The election agency notes that this was after the coalition made 54 attempts with 20 of them being unsuccessful. It further stated that Jubilee had 10 successful logins after 24 attempts. The ruling party managed to access the servers through the former Energy Cabinet Secretary Davis Chirchir. Presenting their submissions during the 2017 election petition, NASA claimed that Chirchir, a former IEBC official and tech expert, had hacked the IEBC servers and helped Jubilee to rig the polls. This was after the IEBC failed to open its servers as ordered by the judges. The report further highlights all the individuals who accessed the serves and the number of times they did. Japheth Kaluyu’s agent is stated to have had three successful logins while Collins Ndindi made 46 attempts to log in but only had six successful attempts. UDP’s Ben Wafuko is noted to have accessed the servers six times. The report further reveals that Thirdway Alliance Bildad Kagai had five logins. The agency also rubbishes the claims that they defied the orders made by the Supreme Court affirming that it granted the parties access as were ordered. Raila’s NASA had revealed that they had been denied access within the 48 hours provided for by the court to verify claims of data manipulation. With the issue being the most contentious issue during the Supreme Court hearings, IEBC has raised objections citing confidentiality of the servers for unrestricted access. At the time, NASA had sought to be provided with details of usernames, passwords, the location of servers, identity of password holders, IP addresses and the software. However, the Supreme Court made orders for read-only access to the information related to the servers, dismissing the confidentiality concerns raised by IEBC.